2017 will be Canada’s 150th Anniversary. One plan of our Federal Government to help celebrate Canada’s marvellous history is to offer boaters, cottagers and campers free access to The Trent-Severn Waterway, The Rideau Canal and Park’s Canada docking facilities and Island Campsites (such as The Thousand Islands or docking/camping at the locks) all for free for the 2017 Season. We think this is a tremendous idea which will generate a big boost in traffic, helping all communities along the waterways. Today, as we left Fenelon Falls, the Lock Master asked if one of their staff might ride down the lock with us. 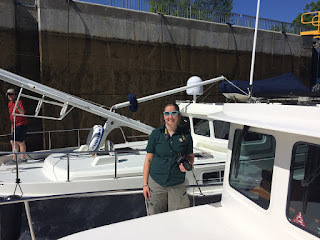 He introduced us to Natasha, The Trent-Severn Waterway’s official photographer for the season. 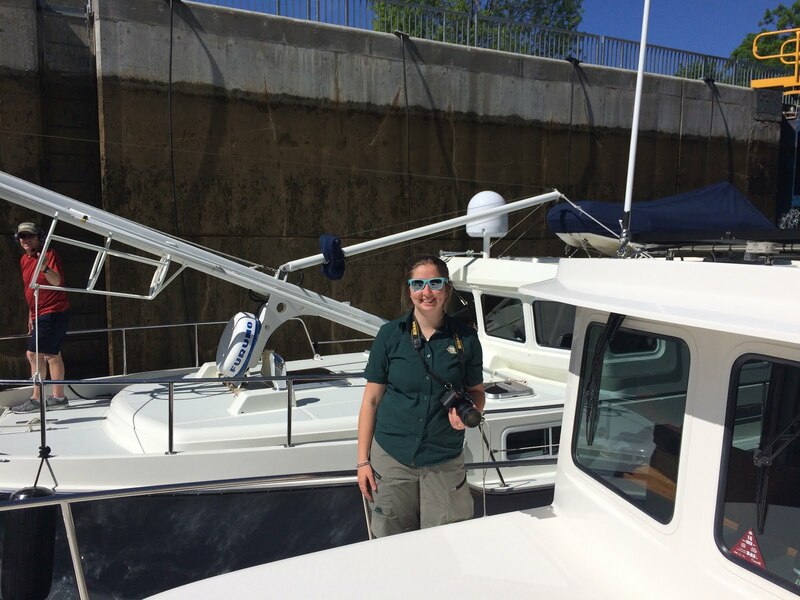 Natasha will help put together various brochures and literature on the waterway for next season. 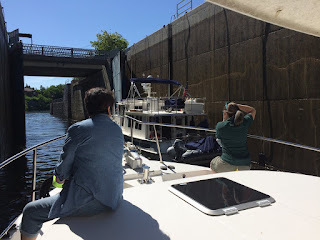 After exiting the Fenelon Falls lock, we cruised down the Fenelon River with its high limestone cliffs lined with beautiful cottages and homes. Then it was out onto the boomerang shaped Sturgeon Lake where the winds quickly picked up to sustained 18 knots. The wind was behind us most of the way making for a very comfortable ride with increased fuel economy :-)) (putting a smile on the skipper’s face). At the east end of Sturgeon Lake we arrived at the lovely little town of Bobcaygeon, known as the “hub of the Kawartha Lakes”. The name comes from an Mississauga Ojibway word meaning “at the very shallow currents”. 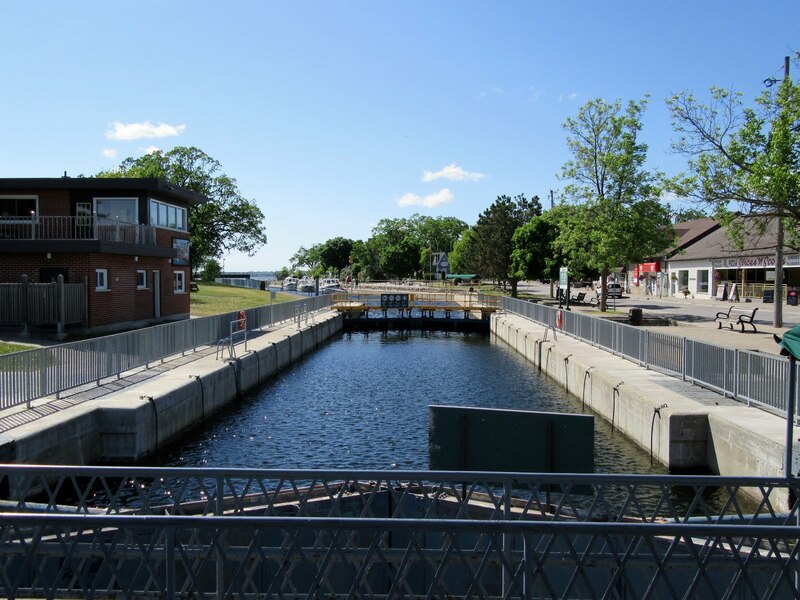 Bobcaygeon is the site of the very first lock built on The Trent-Severn Waterway, which joins Sturgeon Lake with Pigeon Lake. Similar to Fenelon Falls, Bobcaygeon was first settled in the 1830’s with a grist mill and a saw mill being the first commercial enterprises to be established. The Provincial Government started construction of the lock in 1833. Today, Bobcaygeon’s primary industry is tourism, particularly related to recreational fishing. Bobcaygeon is also a hub for the region providing services unavailable in smaller neighbouring communities. Below is a photo of Wings, one of the boats in our small flotilla. It is a Nordhavn 35. You’ll see it has a substantial mast that is in its lowered position. The Trent-Severn Waterway has a limiting height of 22’ to get under bridges and electrical transmission lines. Wings mast exceeds this by a few feet, so we helped lower their mast before we arrived at Port Severn. In addition to buying some groceries and other supplies, Judy had to visit a local dentist to repair a chipped tooth and Stephen visited a chiropractor to help with his sore back (too much work on the boat in early May). We are tied to the lock walls chatting with the many folks who come by to see the boats. What a marvellous community this is. It is especially great to be here now. It gets much, much busier in July / August where the walls will be full of boats and the noise levels will be noticeably higher.